We need to hear them for what they say: advocacy of discredited ideas involving racial purity and intolerance, couched in misrepresentations of U.S. history and the American experience. We need to understand them for what they are: betrayers of what President Lincoln called “our better angels,” of the principles of equality, justice and the rule of law — painfully worked out over time and sometimes imperfectly at the outset, through the self-correcting processes of speaking and writing freely, of assembling and petitioning peaceably for change. Granted, it is tempting after events like those of last weekend to take another view. While there is only a small fraction of our fellow citizens who hold such repellent views on white supremacy and racial hatred, there is the very real danger that a few more, and then a few more than that, will be seduced by false pretentions and misleading presentations of patriotism, economic security and personal safety. History tells us of the rise at various times in our nation of groups preaching hate and bigotry and violence, using their rights of speech, press and assembly to inflame rather than inform, incite rather than inspire, and indoctrinate rather than educate. Nativists, the Ku Klux Klan, neo-Nazis and others at various times have used fear, prejudice and ignorance to flourish and gain public accommodation or support — sometimes for decades — before crawling back under the social rocks from whence they came. It’s tempting to believe that if only such domestic terrorists were silenced by government, their views would dissipate; that “out of sight” truly would mean “out of mind.” But such censoring, suppressing and silencing is a betrayal of our core principles — along with being ineffective and often counterproductive. If it ever was possible, never mind desirable, to counter such anti-American sentiments by silencing its proponents, it is now a lost cause in the Age of the Internet and social media. A few provocative tweets or a viral video can reach a global audience that dwarfs anything possible in earlier human history. 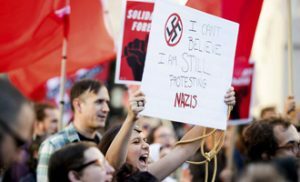 But, the desire “to do something” when we witness demonstrations of hate and regressive ideologies can tempt us to take actions that ultimately erode our freedoms. More than a decade ago, when the hatemongering Westboro Baptist Church group began appearing at the funerals of U.S. military personnel who died in combat, the tiny assembly gained far more visibility than it could have purchased otherwise through its well-publicized fights with municipal authorities seeking to shut down or shunt to remote locations its offensive messages about gays and others. Defenders of free expression sometimes are the target of those who espouse what the late First Amendment advocate Nat Hentoff described as “Free Speech for Me, but not for Thee.” The ACLU of Virginia is being vehemently attacked online for representing in court the white supremacist group that successfully challenged the Charlottesville government’s initial decision to ban the group from gathering in a centrally-located city park, in favor of a more isolated park about a mile away. What other stand should the ACLU, which has been protecting the free speech rights of opposing groups for nearly a century, have taken? The First Amendment protects us all from government actions based solely on our views or the content of our expression. There is no national authority on what’s right or acceptable — no “national nanny” to rap knuckles over offensive, disgusting or repugnant views. U.S. District Judge Glen Conrad, in rejecting the government ban on the alt-right rally in Charlottesville, was not validating the views of those who gathered. Rather, Conrad was upholding the nation’s commitment to free speech, and the view of the nation’s founders that their descendants would, over time and when left to freely discuss and consider all options, arrive at the best solution for the greatest number of people. Hate speech, racial prejudice and policies rooted in white supremacy beliefs were accepted in much of the nation for decades, until confronted by a modern civil rights movement that finally touched a nation’s conscience — and altered its law books — by using all five of the First Amendment freedoms. And the right of free expression stood strong to counter public officials of that era who also cited “public safety” as justification to oppose or arrest those calling for racial justice. We don’t want to hand our government, at any level, the authority to restrain free expression on the mere supposition that it may provoke violence — or worse, because many or even most in a locale oppose it. Over time, we have developed and been well-served by legal doctrines narrowly defining when officials can act to suppress speeches, rallies or marches; doctrines rooted in specific evidence of real, immediate threats to public safety. From schools to sidewalks, those laws focus applying restrictions on conduct rather than suppressing the ideas behind those actions. Let’s concede that this system is not neat and tidy, nor effective in all cases. It requires both great effort and great restraint on the part of police and elected officials charged with public safety. We are debating the limits of free expression in other areas of life today. On college campuses, some argue that their right to be “free from” exposure to some views is greater than the freedom for others to express those views. There is also much debate over the extent to which social media platforms and the internet should now be considered “public spaces” rather than private property, and thus subject to the First Amendment. And the speed and rapidity of the web challenges a legal structure built around communications that moved much more slowly, and less pervasively. In the wake of the tragedy in Charlottesville, we must remain committed to our core belief that we’re better off — and ultimately, more secure — when we may freely discuss, debate and decide. Gene Policinski is chief operating officer of the Newseum Institute and the Institute’s First Amendment Center. He also was a contributing author to the 2014 book “Whistleblowers, Leaks and the Media,” published by the American Bar Association. This entry was posted in Inside the First Amendment, News and tagged censorship, civil rights, fighting words, First Amendment, free speech, hate speech by Gene Policinski. Bookmark the permalink. Thank you so much for a very explicit and thoughtful explanation regarding the importance, the strengths and the imperfections of our First Amendment. Thank you for so eloquently expressing the explanation I have tried to convey to various people, especially those who damn the ACLU for defending the free expression rights of white supremacists. Now I can refer those who advocate repression of hateful ideas to your article. Thank you, Gene Policinski, for yet another of your fine offerings. This is the most lucid, sensible and accurate commentary I’ve read to date on this subject. Hope this gets airtime on the net. It’s well deserved and inspiring.